“LAKSSSSSSSSSSSSSH” Ragini shouts at the top of her voice. Laksh was standing in front of her with closed eyes and ears. It was few months to Raglak’s marriage now, Sanskar got married to Kavitha a month back and now a pooja was organised for both the couples. Downstairs, KavSan laughed hearing Ragini. San: I can’t believe that my calm friend can shout this loudly. Kav: (laughing) Well, this avatar of hers is reserved for her pati dev alone. San: He alone pisses her off. Clothes were scattered all over the room and Ragini was glaring Laksh for this. He was looking her with puppy eyes, but she was not in a mood to melt. Rag: What have you done to this room? Didn’t I tell you I will select your shervani, then why?? This room looks like it was attacked by a monkey! Lak: I was trying to ease your work. Ragini looks around the room. Rag: Like this?? See there, your tie is hanging on the bulb. He smiles sheepishly and she huffs. Ragini went near the bulb and tired to take the tie, but her hand was not reaching. 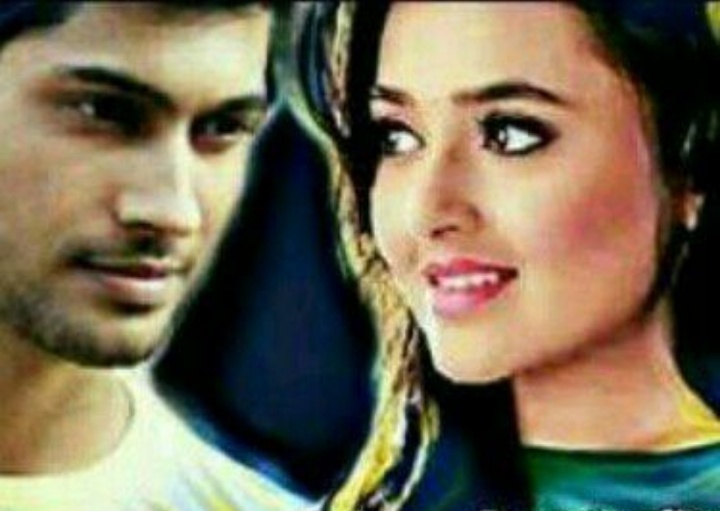 Laksh smiles mischievously and went to her. He hoisted her by her waist. Ragini’s breath got stuck, but she composes herself soon and took the tie. He made her stand on her feet but didn’t let her go. Lak: Why hurry, (huskily) don’t you feel anything looking at me? Rag: Yes, looking at you, all I remember is the state of this room and this tempts me to hit your head with something hard. Lak: You have become dangerous. She looks at him with attitude and then started to clean the room. He was still looking at her, who was cursing him under her breath. Lak: (whispers) I am sure some bhootni got into her. She is not the calm girl I fell in love with. Rag: Did you say something? Lak: I,…I will help you cleaning. He came to her, she had kept folded clothes on the bed, and he took them on one hand and headed to cupboard. Before she could complete dress fell down from his hand. Laksh closes his eyes tightly. Ragini fumes even more. Rag: Why are you hell bend to increase my work? Rag: Like this!! Now stand here quietly. She angrily went to the clothes but slipped, Laksh hold her by her waist before she falls. They share an eye lock. Lak: What would have happened if I was not there? Rag: Mr. Self obsessed Maheswari, this whole situation is caused by you! She was still glaring him, he pouts and made her stand straight. She huffs and gave him dress to change and then cleaned the whole room, while he was standing there idle. Ragini keeps the clothes in the cupboard and smiles seeing something. Raglak performed the pooja, Ragini took Laksh aside when KavSan was performing. Lak: (confused) what with this? Rag: Didn’t you hear what Pandit ji said, this Muhurat is really auspicious, if a couple becomes one today, they would be together for seven births. Lak: (surprised) Rag, Ragini you can’t be serious, I mean, you believe all these, really, and please don’t tell me that you want us to get engaged today. Rag: Why? Can’t we get engaged again? Lak: We can, but not for this stupid reason. Lak: And if it true, I don’t want this to happen. Seven births!! That is really too much. I am not even able to mange for one birth. And seven!! Spare me. He smiles seeing her angry face and forwards his hand. She kept both the rings on his hand. Rag: I don’t want to. She leaves form there angrily. He smiles and goes behind her. They sat on their earlier place, and he inserted the ring on her finger secretly. She was surprised, and smiled, but then looked away thinking about him making fun of her. He smiled. Ap told Ragini to get sweets; she nodded and went to kitchen. Laksh smiles and followed her. Lak: Jhansi ki rani, leave your anger. Rag: (angrily) I am not angry. Laksh: Really? (Forwarding his hand again) Then go on. He held her by waist and pulled her closer. Lak: Because you want it. Lak: Who said I don’t, why else I made you wear the ring? Rag: Then why did you make fun of me? Lak: Ragini, really, what was the logic in what you said? Rag: I, I don’t know. Lak: Do you really believe this? Lak: I know, I know what you feel, so I made you wear the ring, now, you make me wear na. She smiles, and put the ring on in hand. He kept finger on her mouth, and nodded no. She smiles; they had a deep eye lock. As Ragini wasn’t back, Ap sent Kavitha to look for her. Kavitha came to kitchen and saw Raglak. She smirks and coughs. Raglak came back to senses, they were embarrassed, and Ragini immediately left with sweets. Laksh: (irritated) you have a very bad timing bhabhi ji. Kav: Sorry devar ji, but you are speaking as if you guys don’t spent time with each other. Lak: She was angry from the morning, somehow I was convincing her but you..
Kav: Don’t worry, you will convince her, after all how can someone escape from Laksh Maheswari’s charm. Lak: But you escaped na and fell for my brother. He winks back and she opened her mouth in O. He laughs and closes her mouth. She beats him and they laugh. Ragini was standing in the balcony, gazing stars. Laksh came and back hugs her. They smile. He forwarded her a rose, he smiles and takes it. Rag: Every day the same thing, irritate me throughout the day and at night convince with rose. Lak: Of course I irritate you; it’s only my right to irritate and make you angry, and also to take your anger. He kisses her cheek. They smile. Rag: You know, now I won’t get peace without shouting at you. Lak: I know, I too can’t sleep without you shouting on me. Rag: If Swara, Ma and Papa see me shouting like this, they may faint. Lak: True that, I turned a kitten to a wild cat. Rag: I love being your wild cat. He smiles and tightens his grip around her, she smiles widely. Ragini thought about her life, how things changed. Rag: Laksh, never ever leave me. Lak: Because you were and are my strength. Even though h didn’t discuss this with Sanskar, Laksh had observed Sanskar during Raglak’s marriage rituals. The two weeks helped Sanskar as it did for Swara and Laksh was very happy by this. Seeing Sanskar with Kavitha always gives a pleasure to Laksh. Lak: Shall we sleep, it’s getting late. The post ere pyar mein… Raglak (Epilogue) appeared first on Telly Updates.